It’s hard to find a more controversial topic than sugar, which is never far from the media’s attention. From the recent hype surrounding That Sugar Film to the continued demonizing of high fructose corn syrup, we can’t stop talking about sugar and how we’re likely eating too much of it. In an effort to decrease sugar consumption, the FDA has recommended labeling foods with “added sugars.” To determine if this policy change is appropriate, we’ll look at what science has to say about sugar, examining natural and added sugars to see how they compare. Sugar comes in many different forms- the one most people think of sucrose, also known as cane or table sugar. Made by processing sugar cane and sugar beets, sucrose consists of glucose bound to fructose in a 1:1 ratio. Another common, maligned form of sugar is high-fructose corn syrup (HFCS), synthesized from corn. HFCS is sold in two forms: one has 42% fructose, the other has 55% fructose, with glucose and water as the other primary components. Food manufacturers prefer HFCS because it’s cheaper and easier to use than table sugar, two qualities that explain its presence in many processed foods today . Sugars like HFCS are commonly added to food during production, increasing Americans’ sugar intake. Many products that aren’t considered sweet, such as tomato sauce or ketchup, have large quantities of added sugar. Foods we think of as healthy, like granola and yogurt, may also be manufactured with extra sugar. Since added sugar means extra calories and weight gain, the FDA is seeking to define these added sugars on food labels. For the first time, the label will also provide a percent daily value for added sugars, indicating that they should represent no more than 10% of total calories per day . The FDA distinguishes added sugars from the fructose and glucose present in fruits and some vegetables, despite their identical chemical structures. Within the category of added sugars, HFCS in particular has caused a major public outcry, with many groups claiming that it’s more dangerous than table sugar . Opponents are concerned that the syrup is artificial, unnatural and highly processed, and they also worry that the fructose in HFCS may be harmful. To examine the effects of HFCS and fructose, researchers have fed research subjects diets high in fructose, glucose or HFCS. Such studies have concluded that fructose is more harmful than glucose, citing negative physiological outcomes in patients fed a high-fructose diet. These include increased abdominal fat, as well as increased blood cholesterol and triglycerides . Although the results are compelling, many of these studies include very high doses of fructose. One commonly cited study fed participants 25% of their calories from fructose. For a standard 2000 calorie diet, this means consuming 125 g fructose, or the fructose content of more than three 20 oz. sodas sweetened with 55% HFCS per day . Studies with more realistic amounts of fructose, or studies directly comparing sucrose to HFCS, would be much more informative. Based on current evidence, most meta-analyses and reviews drawing from multiple studies conclude that moderate fructose consumption is not harmful [6-8]. Since HFCS has been blamed for the rise in US obesity levels, many companies have raced to replace HFCS with natural “pure cane sugar” . If we look more closely, however, the arguments against HFCS begin to crumble. The sweetest form of HFCS, with 55% fructose, has only 5% more fructose than cane sugar. HFCS containing 42% fructose is much more commonly used, and it contains even less fructose than cane sugar . The problem is not HFCS, but rather too much total sugar consumption. Natural cane sugar is not a healthy alternative to HFCS. Despite their different origins, these two sugars have fundamentally similar properties, and both have negative effects on our health when overconsumed. Having debunked the HFCS controversy, we can turn back to the FDA’s new added sugar labels. Although there’s no question that added sugar is unnecessary and unhealthy, classifying sugars as added or natural doesn’t tell the whole story, and we must consider the context of the sugar we consume. Imagine waking up to a kitchen full of orange: oranges, orange juice, and orange soda. Which one would you pick? The FDA’s new sugar labeling would tell you that a 16 oz. orange soda has 58 grams of sugar, all of which are classified as added sugar . A 16 oz. glass of orange juice has 48 grams of sugar, but none of this is considered added sugar since it comes from fruit . Based on the labels, you might pick the orange juice and assume that it’s healthier than the orange soda. Unfortunately, the FDA’s added sugar label misses a key point – it doesn’t cover sugars from natural sources that have been heavily processed during production. This loophole includes a number of popular fruit-based products, notably fruit juices and smoothies. In these cases, all of the sugars come from fruit, so they are termed natural. However, the manufacturers have significantly altered the fruit’s properties. In doing so, they have changed the way our bodies process the sugar contained in the fruit, which has key implications for our health. Our orange juice example clearly illustrates these principles. Since one medium-sized orange has about 10-13 grams of sugar, the 16 oz. orange juice contains four oranges’ worth of sugar. If you were eating the actual fruit, you probably wouldn’t consume anywhere close to this amount of sugar. Whole fruit contains fiber, which fills you up and keeps you from overeating. The cellular structure of fruit is also important – since your body has to break down the cells of the orange before the sugar can be released, the sugar is absorbed into the blood more slowly. Eating fruit raises your blood sugar levels, but in a slow and controlled manner, promoting fullness and preventing overconsumption . Unfortunately, the metabolic effects of orange juice are very different than those of the fruit. Orange juice does retain the vitamins found in oranges, but the fiber content is very different. During juice processing, fiber is usually filtered out or pulverized, reducing its beneficial, pro-satiety effects. The juice’s dissolved sugar is thus efficiently absorbed by the small intestine and enters the blood quickly . Consuming juice raises your blood sugar rapidly; after the subsequent blood sugar “crash,” you’ll soon be hungry again. Although juice and smoothie companies fairly state that their products contain only natural sugars, fruit and fruit juice are not equivalent. Even if you consume the same number of calories from whole fruit and juice, the metabolic effects are very different. Metabolically speaking, juice is much more similar to soda than it is to whole fruit. In these instances, the FDA’s added sugar labels would fail consumers by providing the illusion that the sugar in processed fruit products is less harmful than that found in soda and candy. 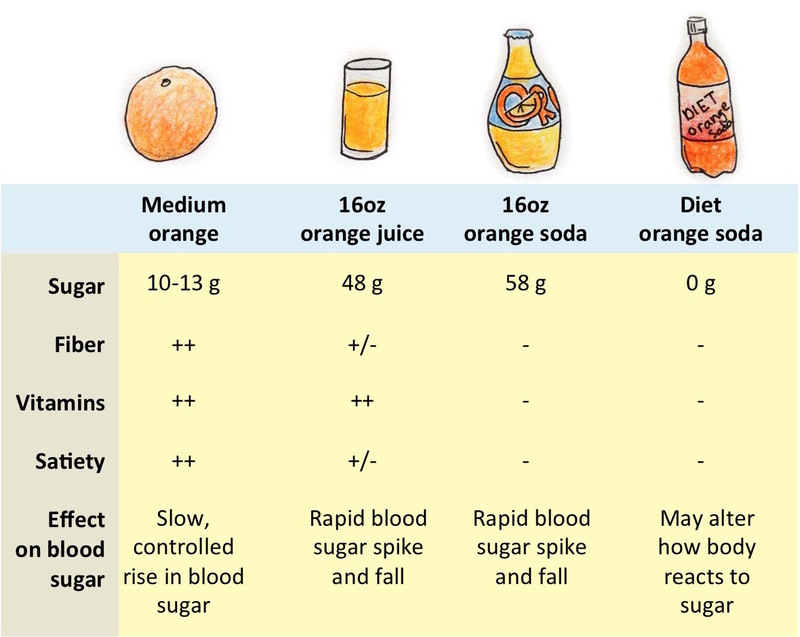 An overview of the metabolic effects of orange-related products. A – indicates little to no effect in a given category, while a ++ indicates an important effect. Is added sugar labeling valuable? Given what we know about added and natural sugars, it’s easy to see that the FDA’s new labeling venture is imperfect and potentially misleading. In the best case scenario, consumers would realize that their yogurt or cereal contain large amounts of added sugar and subsequently switch to lower sugar options. But by separating natural and added sugars, the FDA creates a false dichotomy. The benefits of fruit come from its fiber, rather than its natural sugar. The science does not support endorsing natural sugars over their added counterparts, since these sugars have similar metabolic effects. The FDA’s efforts would be better directed towards education about the negative metabolic effects of high sugar intake. A potential alternative to the natural/added sugar labeling is traffic light labeling, popular in Europe and in limited use in the US. In this system, food and beverages are labeled by color, with green indicating the healthiest options, and yellow and red less healthy ones. In the UK, total sugar content is used to determine a beverage’s rating, placing juice on par with soda . Studies have shown that these simple systems help consumers make better choices, even when they don’t have the time to peruse a nutrition facts label . At this point, you might be wondering if it’s better to choose no-calorie artificial sweeteners over sugar. While we don’t have enough information to conclude that artificial sweeteners affect our health as negatively as sucrose or HFCS, these compounds remain troubling . Some studies have shown that artificial sweeteners do not reduce, or may even increase, weight gain over time . Possible explanations include a continued craving for sweets or negative effects on gut bacteria . Artificial sweeteners do not appear to be a “get out of jail free” card for a sweet tooth. A piece of fruit is a much better choice when you’re craving something sweet. For all of the hubbub about added and natural sugar, the best piece of advice we have now is to simply eat less sugar, with the whole fruit as a notable exception to this rule. Ideally, our diets should be low in sugar and high in fiber, consisting primarily of fruits, vegetables and whole grains. By paying attention to the sugar in prepackaged foods, adding less sugar to our tea or coffee, limiting desserts, and drinking water instead of sugary beverages, it’s easy (and worthwhile!) to reduce our sugar consumption and risk of metabolic disease. 15. The Evidence Supports Artificial Sweeteners Over Sugar. Carroll AE. 27 Jul 2015. NYTimes: The Upshot. I have read that there are differences in the way that some sugars are absorbed into the body during digestion. I am wondering if there is any basis in truth to this and if so does the way sugars are digested have any impact on the body? As a pre diabetic, and currently on a Ketogenic diet – i do not care for the source of the sugar. But for the sugar contents in general. Sugar is sugar and will spike an Insulin reaction. The amount of sugar (natural or added) is what matters, at least for me. Great read and informational article. How are finding the ketogenic diet? Energy wise? I think this is not correct. The amount of sugar consumed is not all that matters. The variance in blood sugar matters too. So if you have some average blood sugar in a given day but that blood sugar varies from really high to really low (ex 40g of sugar from fruit juice), this is much less healthy than the same average blood sugar but more constant throughout the day (ex 40g of sugar from fruit). This article mentions that by referencing slow-controlled blood sugar release vs rapid blood sugar spike. I think the reason is related to insulin response. Too much sugar at once puts a huge strain on your insulin while slow-release is much more manageable, even if there is the same total amount of sugar. I like how this is very readable and understandable for a regular person, thanks! I was confused about the new labelling I’ve seen on bars, etc. I find this article to also be somewhat misleading, as even though all the facts presented are “kind-of-accurate”, some important ones have been left out. For instance, when we talk about fruit juice, it is not the same to buy a juice from a store (heavily processed if it comes from a factory – less so if it is produced with a slow press juicer) than to make it yourself at home. Additionally, when you make your own juice, not all the fibre is stripped away, as soluble fibre remains and it also affects the way in which the sugar in the juice is absorbed into the bloodstream (having soluble fibre helps the body slow down the absorption of sugars). Furthermore, even though making a juice is processing the fruit in a way, the sugar in the fruit (and in the juice) is not the same as the added kind, and our bodies are better equipped to deal with it as they can recognise it as for what it is (natural sugar). Moreover, juices bought in a store (unless cold-pressed, which is usually treated with pressure rather than heat for “pasteurization”, have lost many of the other nutrients during the pasteurization process due to the high heat applied to them to kill potential pathogens, whereas home-made or cold pressed juices haven’t. So, as you can see, this issue is much more complicated than stated here. I, for one, think it is a good step in the right direction to start by informing the public about the levels of added sugars in any food. Plus the new labels inform of both total sugar content and added sugars. Finally, what I am about to share is not scientific data but it is observational data. I have done several juice only fasts in which I have spent several days or weeks consuming nothing but freshly extracted fruit and vegetable juices (4-5 a day, 500 ml each on average) and two of those times I had blood tests conducted both before and after the juice fast. In both cases, my fasting blood sugar levels and cholesterol levels were significantly reduced after the juice fast. If natural sugar, and specifically that in juices, is so bad for you (or as bad as added sugars), how come my total blood sugar levels have been reduced twice after having spent a whole week each time on nothing but fruit and vegetable juice? I totally agree that education should play a much bigger role than it presently does in regards to sugar and nutrition in general, both at a school level and at univerist level (many doctors, for example, are pretty clueless in regards to how important nurition is for health). But this article is also an educational tool, and I think it should have been written more carefully, painting a wider or more picture. I meant say “…painting a wider or more precise picture” in my last sentence there. I would also like to add that it would have been nice for someone to have replied to the posts people have posted here. There’s no point in having a reply or post section if there’s going to be no interaction from the writers. This is my biggest question! I have had a really hard time finding credible information on this. It would be amazing if this were true, but this article is saying the exact opposite. I am truly open minded about it, but have seen more science suggesting that your body may not be able to distinguish between sources of sugar. I can see both sides, and just want to have a healthy diet that isn’t unreasonably restrictive. Does anyone have any studies specifically looking at this? I see tons of recipes using honey and dates as sweeteners and I WANT those to be better (grams to grams) than added sugar, but I have not seen the evidence. In what way is it different? How do you know this is true? I was expecting something better from Harvard, I was wrong. You need to do more research. You ignored the Princeton study, didn’t read your own resources, and used Mother Jones. Here is the Princeton study, in an easy to read form for you, by the way, they used half of the HFCS in the study than the sucrose: https://www.princeton.edu/news/2010/03/22/sweet-problem-princeton-researchers-find-high-fructose-corn-syrup-prompts.